I had planned on showing you my Friday work outfit today and perhaps even my weekend dinner outfit (the shoes are killer) but this morning when I stepped out to take pictures I thought my outfit was so cute that I had to share it now. There are so many colors, there is a cute pattern and my latest Shop Suey Boutique pick to talk about for review – so how about I just dive right in? This month for my Shop Suey Society post I got to pick whatever I wanted from them store and the choice was very easy. I wanted the Alex Shoulder bag in purple. I’ve wanted a very lady like shoulder bag and this quilted style with a chain strap screams ladies who lunch to me but the purple color makes it more modern and youthful. Plus, I love color and am over the moon about the colorblocking trend that is so hot right now, so I’m all adding as many great pops of color to my wardrobe as I can. I love the size of this bag, it can hold my iPad, makeup bag, essentials kit, cell and more without feeling like you’re barely squeezing it shut. And if I want to wear the bag more casually I can adjust the strap to make it a crossbody bag, versatile and stylish! The dress is from the relaunch of Target’s most popular Go International styles and it’s the Tucker for Target floral dress, that I didn’t think I’d love but I really do. I had a gift card from Target in my pocket and my neighborhood store had racks full of dresses so I tried them on yesterday and fell instantly for this dress. Instead of the matching ribbon belt I added my own metallic belt and I pulled out my favorite boyfriend cardigan to really make the flowers in the dress pop. Add a pair of We Love Colors tights in Maroon that I already had and my two-tone Mary Janes and I think this is a fun and vibrant look for spring. And if you look really close at the dress, there’s a purple outline in the flowers, hence why I’m rocking the purple bag. I find a way to make it all work together, somehow. And since I’m wearing so much color, I kept my makeup fairly neutral and light today, I didn’t really need to go heavy with lipstick or eye makeup. I have a feeling you’ll be seeing me wear this dress a lot this spring into summer and back into fall with tights. It’s comfy, colorful and makes me feel so vibrant and that’s exactly how I like my clothes to feel. I also have a feeling you’ll be seeing this bag on my shoulder a lot from casual to dressy, it’s just so perfect to me. So what do you think? Like my color combos? How about the bag? Oh and don’t forget, you can get 20% off this bag (or any full price bag) at Shop Suey Boutique with the code Art20! 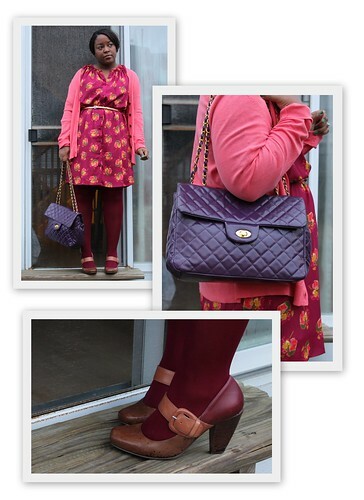 I love how all the colors came together.I really love the purse & shoes…. 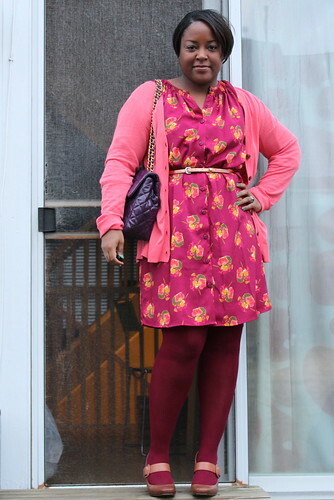 love, love, love the color combinations… looks really pretty on you! next to their isaac mizrahi collabo several years back, the tucker for target line is my next fave! @Stylin’ & Profilin’ Oh I still have a skirt from the first Isaac Mizrahi collection, the white one with the huge poppy flower on the front. Loved it! I also have the Rodarte sequin shift with the ribcage on the front. Love that dress too. These collabos make you feel like you get to have a piece of something special. @Gabriella, Thanks! I love that bag, I think I’ll be carrying it a lot. Plus it forces me to not carry around a tote bag crammed with useless stuff I don’t need.